The Farmers Bank is here to help you fulfill your dream of home ownership. Whether you are looking to build, renovate, or purchase an existing property, we have a solution to meet your need. If you are wondering what type of account might be best for you, complete a brief questionnaire to help us learn how to meet your needs. If you need a loan, take time to talk to one of our professional, experienced, and dedicated lending officers. We have confirmed suspicious activity related to our ATMs which has resulted in some fraudulent activity on certain accounts. Management is working diligently to address this fraud. If after review of your account, you believe that you may have been a victim of this fraud, please contact the bank to complete an Affidavit of Fraudulent Activity. Toll free 1-877-405-7797. After business hours or on weekends, please call 1-800-554-8969. $5.00 service charge for months in which the minimum balance is not maintained. Want an Account that offers you more? 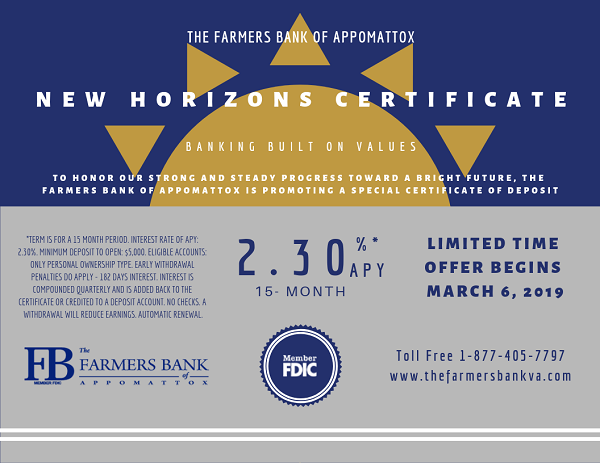 As a benefit of being a client of The Farmers Bank of Appomattox, you can receive insurance quotes from Bankers Insurance, a specialist in home, auto, and all personal insurance coverage. Quotes are always free and no-obligation. All services administered by Bankers Insurance LLC. Whether you are looking for an auto loan or require cash for other needs, Farmers Bank is here to help.